Werewolf and Werebear Essentials is a compact edition of Moonlight Tales with my favorite (and arguably best) features. Aims to be totally bug free, it is compatible with any mod and has no impact on performance. New features include: countless new skins, lunar transformations, werebears, new abilities, custom animations, sound effects. Brevi - Main author and developer, scripting, technical aspects and execution. Creator of The Howling werewolf model. Al99 - Co-author, creative feedback, design advice, documentation and testing. NsJones - Co-author, fur and eye textures, sound and audio (power jump, moon howls), creative feedback, design advice and testing. MadCat221 - La Femme Lycana female werewolf model. VectorPlexus - Mighty Beasts werewolf models. Zerofrost - Apex werewolf model. TheOutlander - Unique eye mesh edits that allowed for the left and right eye to be separately customized. Alkaiser - Converting Mighty Beasts models into Moonlight Tales. NsJones - Heart of the Beast werewolf textures. KrittaKitty - HD Werewolves skins and eye textures. Apex werewolf extra eye textures. Fiszi - Bad Wolves Skin Pack. Zerofrost - Apex werewolf original body and eye textures. Korodic - Werewolf Aftermath Re-Equipper. This project is the latest creation in the line of my werewolf overhaul mods. It is a compact edition of the original Moonlight Tales with my favorite (and arguably best) features. The project aims to be totally bug free, to be compatible with any mod and to have no noticeable impact on performance. Everything was re-written from the ground up with higher focus on quality and optimization. You can read in detail about each feature bellow. The mod comes with a skin system that allows you to customize how your Beast Form will look like in-game. To use this feature enter into the Mod Control Menu (MCM) within SkyUI's main interface and use the drop down selections. It's really easy to handle and everything has mouseover descriptions to help you navigate. New since Patch 2.0: Skin switching has never been this elegant and effective! What has been improved? • Werebears are playable once again! This time around they appear as a visual only option, but will have their very own Howl at the Moon sound effect! 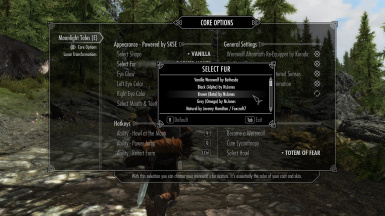 • The FURTASTIC Werebear Skins mod by KnErBSE73 is integrated into the skin system. 30 new furs, 4 teeth colors and 8 new eye colors! • All originally included shapes (models), furs (body textures), and eyes are still available. For example: Alpha, Beta and Omega furs by NsJones. • KrittaKitty's HD Werewolves Skins have been fully integrated into the mod. All 11 fur textures and 13 eye textures are now available. • Big Bad Wolves Skin Pack by Fiszi - Added 12 new werewolf body textures created by author Fiszi, based upon KrittaKitty's original textures. • All 6 Mighty Beasts Models by VectorPlexus with full weight slider support are added to the system. • The left and right eye color can now be separately customized. This opens up countless new variations that were impossible before. • Eye glow settings are also separately customized. You are no longer forced to always use the brown eyes without glow. • Mouth & teeth textures can now be separately customized. Even more options! • There is no longer any delay on transformations. In the old system there used to be a shot screen freeze when you became a werewolf. • The transformation effect also gets re-colored with the fur textures resulting in a spectacular transition. • Apex werewolf model from Zerofrost is still available! How was this accomplished in technical terms? 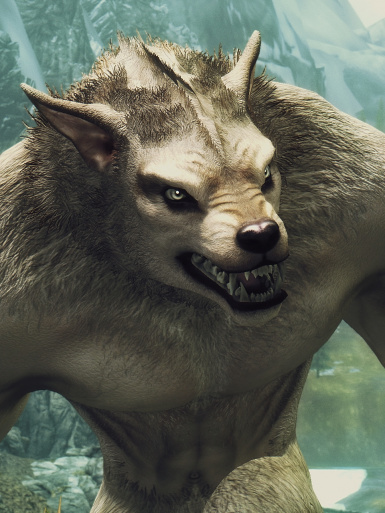 The skin system jumped from the maximum 244 werewolf appearance variations (3 werewolf models x 6 werewolf fur textures x 12 werewolf eye textures + 1 Apex werewolf model x 1 Apex fur textures x 28 Apex eye textures) to 2 721 628 werewolf appearance variations (9 werewolf models x 28 werewolf fur textures x 4 werewolf eye glow settings x 30 werewolf left eye color textures x 30 werewolf right eye color textures x 3 werewolf mouth & teeth textures + 1 Apex werewolf model x 1 Apex fur textures x 2 Apex eye glow settings x 14 Apex eye textures). If anyone is wondering there are 432 000 werebear appearance variations (1 werebear model x 30 werebear fur textures x 4 werebear eye glow settings x 30 werebear left eye color textures x 30 werebear right eye color textures x 4 werebear mouth & teeth textures). You think I calculated it wrong? Nope. These large numbers are not that impressive in game development terms, as most character creations have well in the billions of possible outcomes with all the sliders... but compared to what we had before: this is a huge improvement! These commands allow me to switch anything on the werewolf separately. There are 3 Classic werewolf shapes, 6 Mighty Beasts werewolf shapes and 2 more radical Changeling shapes available for selection. For each Mighty Beasts and Classic Beast Form shapes (models) there are currently: 28 furs (body textures), 4 eye glow settings, 3 teeth and mouth textures and 30 eye color options. The left and the right eyes can be customized separately. See each option bellow! Currently available: 1x fur (body texture), 2 eye glow settings, 1 teeth and mouth texture and 14 eye color options. The left and right eyes cannot be customized separately. Please refer to the Raven Witch Armor and Apex Werewolf by Zerofrost Satyr mod page for more information! Currently available: 30 furs (body textures), 4 eye glow settings, 4 teeth and mouth textures and 30 eye color options. The left and the right eyes can be customized separately. Please refer to the FURTASTIC Werebear Texture Overhaul by KnErBSE73 mod page for more information! 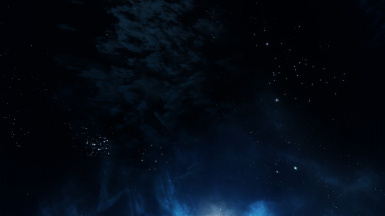 Skyrim offers picturesque views of the night sky and is faithful to details such as moon phases. Unfortunately they have never been fully utilized in the vanilla game, which is a shame especially if you’re a werewolf. In Moonlight Tales, your life as a werewolf or werebear is deeply bound to the stages of the moon. These transformations occur by themselves (forced) during nights depending on the influence of the Masser moon (the large moon in Skyrim). The transformation will last during the whole night and you will only regain your humanoid shape at 6AM in the morning. The transformation chance and many other details for each phase can be customized in the MCM. Those of you who know the Tales of Lycantrophy mod will surely remember screen messages, warning the player about the imminent transformation. It's a full moon tonight! * In Skyrim Bethesda defined the full moon to last through 3 nights. Many werewolf players sent me feedback requesting the full moon to only last for a single night instead like in real life (and also most works of fiction). I cannot modify the lunar cycle itself but I came up with an alternate solution instead. The night before and after the night of the full moon is now labelled as: The moon is almost full. This phase will come with it's own transformation chances allowing you to finally have only one full moon night per cycle. • Full Moon Fever - This preset is for players who wish to transform only on the night of the Full Moon. This will occur only one night every 24 in-game days. • Warg - The Warg setting spreads relatively small transformation chances to keep lunar transformations rare and surprising. On the night of the Full Moon you will always transform and on the night of the New Moon you will never transform. • Skinwalker - This is the default preset. The Skinwalker setting has balanced transformation chances to make lunar transformations happen occasionally but still not too often. On the night of the Full Moon you will always transform and on the night of the New Moon you will never transform. • Cursed Blood - The Cursed Blood preset comes with high transformation chances and will result in a lunar transformation almost every night. Only the night of the New Moon will provide some safety. • Nightmare - With the Nightmare preset you will transform every single night regardless of the moon phases. 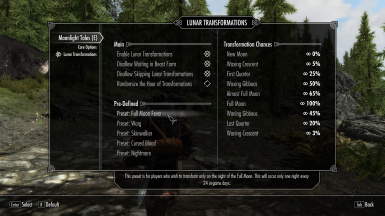 • Randomize the Hour of Transformations - With lunar transformations enabled the player has the chance to transform each night exactly at 8PM. With this Randomization setting the time can be anywhere from 8PM to 10PM (rolled each night). 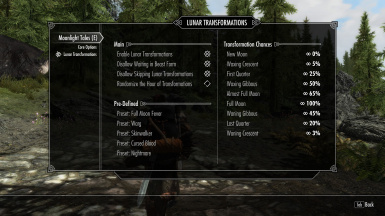 This setting updates after the next lunar transformation. • Disallow Skipping Lunar Transformations - Interrupts the player from sleeping / waiting through nights when there should be a lunar transformation chance roll. Once the chance has been rolled, wait / sleep options will be available once again. • Disallow Waiting in Beast Form - Prevents the player from waiting in Beast Form. Werewolves are restless beings! With default settings it's activated by the V hotkey. This move boosts your reflexes when the setting Heightened Senses is enabled. It comes with a new animation made by Bethesda that is unused in the vanilla game. Nearby wolves and werewolves will howl back to you! (They must be out of combat. There are specialized sound effects for wolves and werewolves who return your howl depending on their distance from the player.) The sound effects were made by NsJones. Heightened Senses: Grants you 100% chance to slow time for 2 seconds when enemies power attack against you. The reflex buff lasts for 60 seconds after each howl. By default this ability is activated by the left CTRL hotkey. Using it will return you to your human shape after concentrating briefly (around 5 seconds). The move comes with a new animation made by Bethesda that is unused in the vanilla game. Does not work during lunar transformations. By default this move is activated by the Q hotkey. Activating it on the ground will make your next jump (4 second window) more then 3 times as powerful and will protect you from fall damage until you safely land. You can also use it mid air to just protect you from fall damage. It cost 30% of your total stamina. The sound effects were made by NsJones. When this feature is turned on, it will remember all your equipped items and spells whenever you transform into werewolf form and automatically equip them upon returning to your human shape. The code was improved to remember dual wield weapons and to function with custom enchanted items. 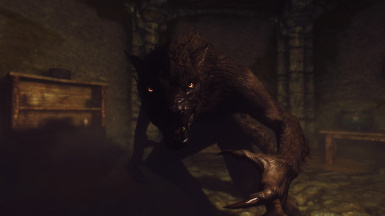 When this feature is enabled, wolves and werewolves will be friendly to the player even in human form but only if you are a lycanthrope yourself. Has to be turned off manually to disable it if you cure yourself. When turned on, the Wolfkin Alliance feature updates whenever you transform into werewolf form. You will need both FNIS Behavior and FNIS Creature Pack. 1. Download the mod and install it with Nexus Mod Manager or Mod Organizer or manually copy it into your data folder. • My werewolves are stuck in a sort of T pose and do not play animations. 1. Run GenerateFNISforUsers.exe and click 'De-Install Creatures'. 2. Once that is done, click 'Update FNIS Behavior'. • You load a saved game in which you are in Beast Form, and you look like a vanilla werebear regardless of what skin you selected. This problem should no longer occur in patch 2.06. Go to MCM and switch skin to make your visuals update. • My werewolves are not playing the new animations. 1. 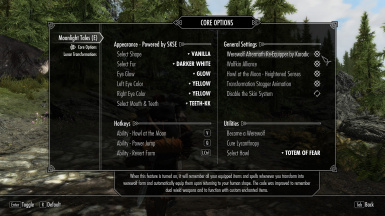 Verify that you have both FNIS Behavior and FNIS Creature Pack mods installed. 2. Run the GenerateFNISforUsers.exe and click 'Update FNIS Behavior'. If it still does not work, then download FNIS again and verify that the files are not corrupted. • FNIS does not detect Moonlight Tales - Werewolf and Werebear Essentials, and the animations therefore do not get added. 1. Download both FNIS Behavior and FNIS Creature Pack again. 2. Install them both again overwriting all existing files. 3. Run the GenerateFNISforUsers.exe and click 'Update FNIS Behavior'. • The mod does not show up in MCM menu. • I'm stuck in slow motion and it does not seem to fade away. This is a vanilla Skyrim problem that happens on rare occasions with all slow time effects. To fix the problem simply save the game and load it up again. 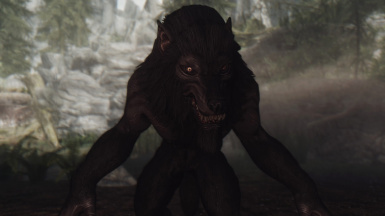 • I updated from the Moonlight Tales Overhaul mod to Werewolf and Werebear Essentials and now my Beast Form does nothing. 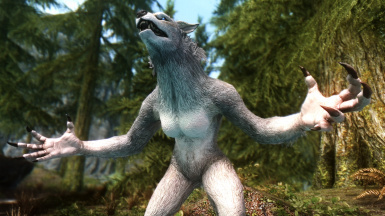 This issue will only happen if you became a werewolf from a different source then the Companions and you install the mod after that. It will only occur the first time that you try to use the Beast Form ability, but it will work fine for the second and for the rest. • I can only use the new abilities (Howl at the Moon, Power Jump) once or twice each transformation and then they stop working. • Revert from does not work, werewolf functions like transformations are buggy and broken. 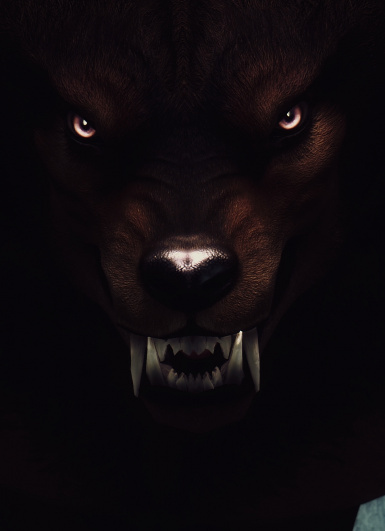 Please verify each mod that is werewolf related as you can only have one mod that modifies this script. Note that Werewolf and Werebear Essentials does not edit this script. Verify that these mods are properly uninstalled and their BSA archives and script files are deleted. I highly recommend using Mod Organizer to install / uninstall your mods with. • How do you update from an older version? Simply overwrite the existing files. No special actions are needed, no need to run FNIS again. • Is this mod compatible with Werewolf Mastery or other werewolf mods? Yes it is. This edition of Moonlight Tales should really be compatible with anything. When installing numerous werewolf related mods you must still check if they are compatible with each other. All mods in the recommended section are compatible with each other (unless stated otherwise) and Moonlight Tales. • Can you add x feature from Moonlight Tales or Tales of Lycanthropy? Short: No. Longer version: This mod is not going to be the 'new' Moonlight Tales Overhaul. It's a compact edition with less features but as mentioned in the description it is much more stable, takes no performance away, and compatible with everything. New features are a possibility but there are technical limitations that come into play. • I want to run Moonlight Tales with Werewolf Mastery. Load order and installation info? 'Werewolf_Mastery_by_RolandSir_MainFile_v3_0_DG' or 'Werewolf_Mastery_by_RolandSir_MainFile_v2_0' and not the compatibility versions. This mod is compatible with everything and DOES NOT need compatibility patches. It will cause errors if you use compatibility patches regardless. • Can both edition of Moonlight Tales run together? They can but I don't recommend this. You will loose the advantages of this version: no bugs, no performance drain and compatibility with every mod. In addition overlapping features must be disabled appropriately in one of the mods. • Should I wait for my next playthrough to install this mod? Should I update from Moonlight Tales Overhaul? It's your choice as always, but there is no technical reason why you would need to wait. This mod is done in a way that you can just slap it on any time and it will work. If you don't like it you can also always remove it and it will cause no problems at all. Your save game is safe. • What happens if I'm not yet a werewolf? What happens if you are already in the middle of the Companion Questline? These conditions do not matter. The mod will work fine regardless of when you install it. It will not cause trouble with the Companion Questline. • Does the mod work with a controller? Can you use the new abilities? Yes, it works with controllers. Use MCM to remap the buttons to your gamepad. • Can I use this mod together with shapeshifting mods? 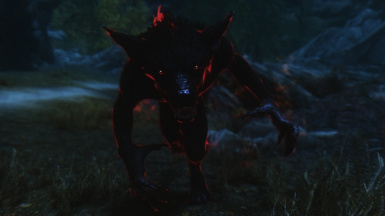 Can I play with a werewolf vampire hybrid mod? Players using shapeshift mods (Wrath of Nature or The Uchiha Clan for example) or vampire-werewolf hybrids can properly play if they disable the Aftermath Re-Equipper and the Transformation Stagger Animation. 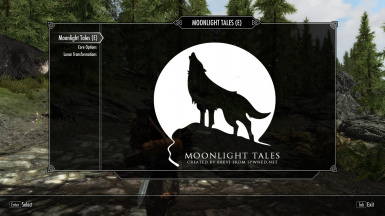 These mods have been included (or partly included) in Moonlight Tales Essentials with their author's consent. Show your support by endorsing these projects! The fur and eye textures are included in Moonlight Tales, but not the sound files. I suggest the 'Alpha werewolf sounds' file. It's a great heat and night vision mod for werewolves and vampires. Upon eating corpses, the bodies are replaced with blood, gore and assorted bones. Displays the in-game time, date and the current moon phase, among many other useful features. A great overhaul that includes many options to customize your experience. Fully compatible and no extra steps are needed. Allows you to play from first person view in werewolf form. 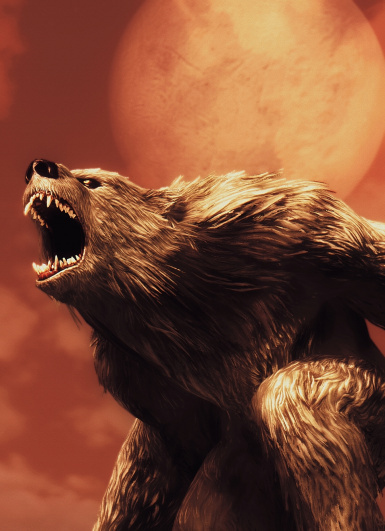 A killmove mod that has several great settings for werewolves. Extends the features with both new ideas and old ported code from the previous versions (Moonlight Tales Overhaul). The mod uses scripts that run constantly in the background. If you want only smaller but specific changes to your werewolf then a modder called Paradox has lots of nice small mini-mods on Steam Workshop. Note that these mods are not compatible with Werewolf Mastery as they cover the same areas, but of course fully compatible with my mod. 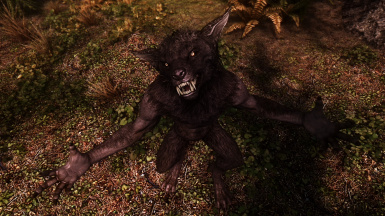 A mod that allows werewolves to loot and interact with objects. Requires Dawnguard. Same as above but for vanilla Skyrim without Dawnguard DLC. Same as above but also allows you to feed on animals.